The other day, Vernon helped the neighbors bring in their cows. It was one of the days that it rained… on top of snow… creating a slippery, sloppy mess! It was cold and foggy, with a wind chill increased because they were riding four wheelers instead of horses. Vernon is now the proud owner of an iPhone, so he actually took some photos for me. Trailing across a major draw that should just be snowy, the cows had to hike belly deep through a rain caused creek. Where the draw narrowed, it actually was four or five foot deep! 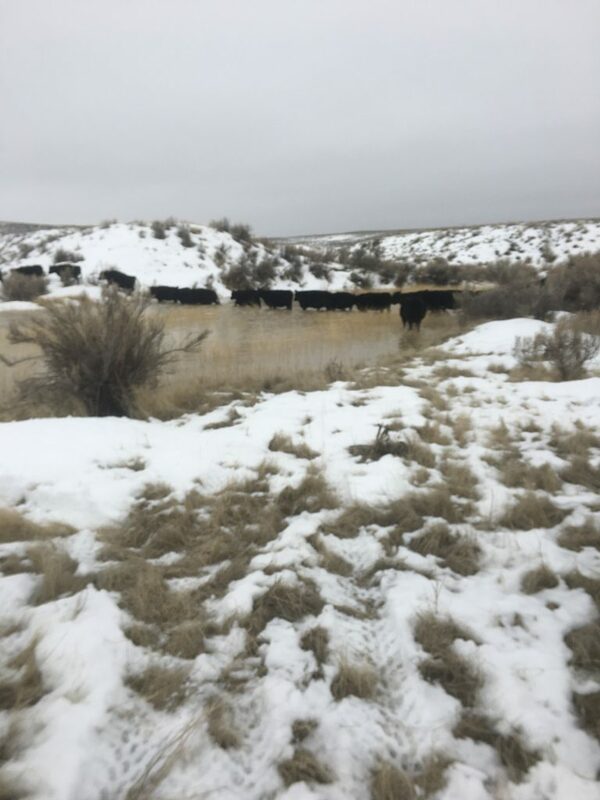 When they made it to the next draw, the front of the herd crossed a dry creek, but by the time the middle of the herd got there, it was flowing water as well. It sounded like quite the time. makes me wonder how they crossed on the 4 wheelers? Cowboying is indeed a tough life style- keep up the good work! No wonder that cowboy is so sick. Get well soon, both of you.